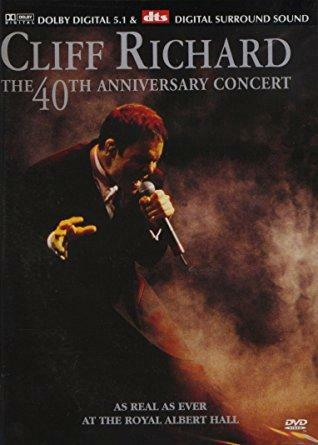 Cliff Richard - "The 40th Anniversary Concert"
Ten years after the sold out double-concert in the Wembley, when Cliff Richard celebrated 30 years of stage experience, the next decade of live-performing is heralded with a big concert. Boredom had no permission to enter the dignified Royal Albert Hall on both days in September 1998, as Sir Cliff Richard had been untiringly working on his repertoire. He presented a multifaceted program, which not exclusively consisted of old hits, but was much more an enjoyable mixture of classics, new original compositions, personal favourites and bows to the greatest songwriters. Whether in an elegant white suit or in a ceremonial dark outfit, either playing “Move it” on his guitar or hypnotically swiveling his hips – the man, who was 59 when this picture was taken, doesn`t look his age at all, not even from a close-up view.